Extracurricular Activities : Dance and Music, especially "Ghumelo", a famous dance of Uttarakhand; Sports: Kho-Kho and Kabaddi. The village of Magron is prominently situated on the Maletha - New Tehri Road amidst natural beauty. Flower laden trees and creepers captivate the visitors and fill their hearts and souls with divine feelings. Guru Manignath Mandir is a great Temple for the people of this area. As a mark of respect and to seek his blessings they always offer every product of their farming in the Mandir before they put it for their own use. Besides, there is also a Lord Shiva Temple. Omkarananda Ma Sharada Vidya Mandir School has been founded in 1990 and runs Classes from Nursery to Classes V. The Management and Staff are very dedicated and committed for imparting good education to their children. 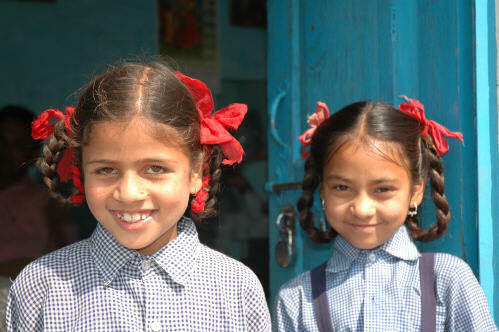 Small children at a radius of more than 3 kilometres come for study. 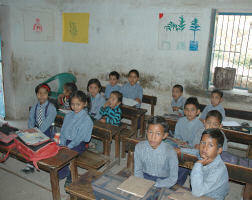 The students of this School are receiving prizes regularly in the writing and drawing competitions. The School gives equal importance to develop sports and cultural talent of its students. This School has now become a leading Institute of child-education of the area and enriched the reputation of Omkarananda Schools.